When we first bought our house, as well as having a huge renovation project on our hands, there was also the land – tough weeds and a large part covered in brambles. Someone mentioned goats as being a great solution to our problem – maybe it was a joke….one of the drawbacks of living in a foreign language. A couple of months later, whilst driving in the neighbourhood, we saw a wonky tumbledown sign to ‘Fromage de Chevre’. We turned into the traditional Gascon farmhouse and met Magali, who was dealing with around twenty kid goats, which had been recently born. We chatted, I petted the kid goats, and we bought some cheese. to make up our minds – of course we said yes. We returned home and identified the old wine barn adjacent to the house as the perfect goat nursery. Magali explained that they would need to be fed twice a day by hand, until they could go out into the field – I drove to the farm every day to pick up the hand-drawn milk. 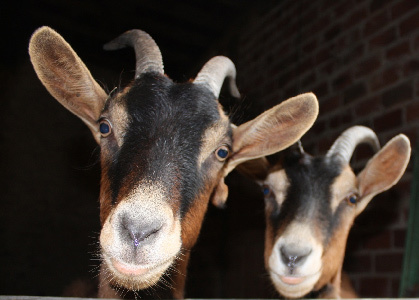 Goats are affectionate and very intelligent and we became quickly attached to them. We named them Eleanor of Aquitaine and Henry Plantagnet. There were two kids about to go to the butchers, were we interested in taking them? Of course we said 'yes'. The trouble started when Henry and Eleanor were due to go into the field. Their early life was spent next to our house being bottle fed, and the idea of going into a field was clearly abhorrent. The field in question was about an acre, and full of brambles, but Henry and Eleanor spent their whole day standing at the top of the field looking at the house longingly. We had built a simple fence to keep them in, until one day Magali arrived to de-worm them and clean their hooves. Instead of opening the gate, she nimbly hopped over – this was when it started to go horribly wrong. Our Alpine goats from Chamonix quickly realised how easy it was to leap the fence. As soon as we’d turned our backs, they escaped into our freshly planted orchard, stripping the young branches within minutes. After destroying the fruit trees they then moved into the garden, eating the choicest flowers. Fresh bramble shoots were off the menu. 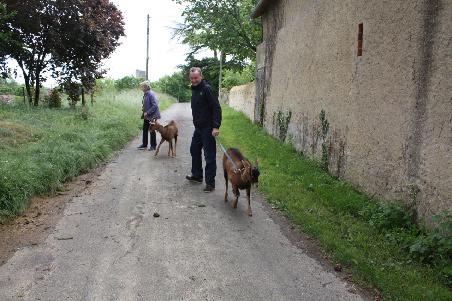 Taking the goats on walks along country lanes so they could munch the hedgerow was clearly not common practice – the local farmer’s wife had to stop her car as she cried with laughter at the spectacle! without fail, until we decided to bring them back into the wine barn. At this stage they were growing fast, and they needed A LOT of greenery. The only way to do this was to take them on walks along the country lanes with the dogs, so they could munch in the hedgerow. This was clearly not common practice as the local farmer’s wife had to stop her car as she cried with laughter at the spectacle. This was not a long-term practical solution, plus the fact Henry had developed some impressive horns, and had decided that my husband was now a rival. Several attempts at my husband’s castration didn’t help his cause. It was time for them to go. Walking Henry and Eleanor to get some greenery!